Skills in a fantasy world are always a bit of an odd subject. Skills, like other technologies, are just ways of taking advantage of the way that the world works. In reality, an expert fire-builder and tender will know how to carry hot coals in a canister, how to waterproof matches, how to make and use a bow-and-drill firestarter, or start a fire with a magnifying glass, or build and use a birchbark pneumatic firestarter, or start a fire by getting sparks out of a variety of natural and artificial materials, how to find tinder in the wilderness – or a city (starting with bark, dry tree fungi, grass, the rotten wood inside hollows in trees, paper, old leaves, and plenty of other materials), the most effective ways to use an assortment of accelerants and fuels, how to refuel old-style cigarette lighters, how to replace the flints in an old-style sparker, how to make candles and various kinds of firestarters, and a lot more. Real experts will probably know how to create various fuels, explosives, and incendiary devices. Then there’s how to use tongs and gloves, how to arrange fires to cook on or for other uses, how to control their spread, the best options on how to survive one that’s out of control, basic treatment for burns, and much more. I picked up a lot of those things going camping and from survival books, more in chemistry class, and still more from lots of other sources – and I’m no expert. Of course, in most fantasy worlds, a lot of things work on magic, and many of those options don’t exist – but I’d expect a fantasy expert to know the equivalents. So OK, only a few of the great masters of fire – men that most consider wizards and masters of hidden arts – will know the three words and seven gestures that can make a fire ignite instantly, burn underwater, flare up, shrink away, open a safe path, unburn something, or rise up to smite an enemy – but why don’t quite a lot of smiths know the charms that protect their hands from fire, temper blades, and keep steel from rusting? The real answer is probably that the authors wanted to keep skills quick, simple, easy to relate to the real wold, and easy to understand – as well as wanting to maintain a firm distinction between what WAS “magic” and what WASN’T – but it is a bit of a gap. If you want to fill that gap in in your Eclipse game I’d recommend taking Shaping, Pulse of the Dragon and Heart of the Dragon, all Specialized and Corrupted/it requires a DC 15 skill check to produce a level zero effect, each skill is associated with a specific effect, each effect can only be attempted once every five minutes, the user must have at least four skill points in a particular skill before it’s effect can be employed, and creating such an effect is considered a swift action (10 CP). That will give a skill expert a selection of minor magical effects to draw on – and is easily upgraded later on to cover first, second, and even third level effects at DC of (say) 20, 30, and 45. 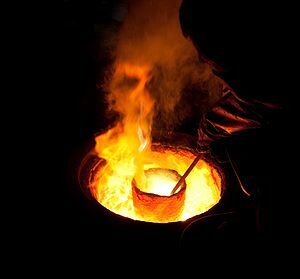 Admittedly, that would be getting expensive and difficult – but by the time you’re approaching level twenty, the cost is fairly minor and it would add a lot of interest to Craft/Metal when you could “Call forth the memory of Steel” and unleash the flames of the forge against your enemies as a fireball every so often. Escapology: You can easily slip away from larger opponents. If you’re grappled or pinned, you gain a +4 bonus on your Escape Artist check to get away for each size category your opponent is larger than you. That’s Immunity/Grappling (Uncommon, Minor, Great, Specialized and Corrupted/only usable once per encounter or every few minutes out of combat, only provides a +4 bonus per size category the opponent is larger than the user, 2 CP). Of course, that general mechanic could be used for Twisting Parry (helps protect your weapon against a sunder attempt), a bonus to spotting members of particular races when they’re disguised, or a host of other special-purpose defenses. Escape And Strike: You can follow up a successful escape from a grapple with an attack made against your flat-footed opponent as a swift action. That’s Opportunist, Specialized and Corrupted/only usable once per encounter or every few minutes out of combat, only usable with a light weapon, counts as a swift action, and the user must already be holding the weapon to use this trick (2 CP). OK, that same general mechanic is usable for all kinds of “followup actions”. Far too many to actually bother listing though. Extreme Speed: You can move more quickly than you normally could. That’s Celerity (+10′ ground movement), Specialized and Corrupted/Corrupted/only usable once per encounter or every few minutes out of combat, requires the expenditure of your swift action for the turn. This one I’ve already generalized; it’s not like Celerity is a particularly uncommon effect. Why bother with one trick for climbing, one for swimming, one for tumbling, and one for running when the same enhancement can simply cover all of them? False Casting: You can make the casting of a spell look and sound like the casting of another spell of the same level, thus preventing specific counterspelling. That’s Immunity/having your spell recognized while you’re casting it (Common, Minor, Major, Specialized and Corrupted / only usable once per encounter or every few minutes out of combat, requires a swift action (2 CP). Now this mechanic can be applied to a lot of other things. Want to plant incriminating evidence on people while apparently just talking to them? Open a lock without seeming to? Get out a weapon without giving the alarm? Minor variants on this will do it very nicely. Group Distraction: You can use the Bluff skill to feint against multiple opponents at the same time, although each opponent gets their own Sense Motive check. That’s Immunity/the rule against using Bluff against more than one opponent at a time (Common, Minor, Minor), Specialized and Corrupted/can only be used once per encounter or per one-minute period outside of combat, the Bluff check suffers a -2 penalty per additional victim beyond the first (2 CP). Wait, where was Bluff inherently limited to one opponent at a time anyway? I’m not at all sure that I’d make a character buy a special ability to do this – and if I did, I think I’d allow them to affect at least (Cha Mod +1) individual opponents without penalty. Still, this is the generic build for making a skill do something unusual – and so can be applied to dozens of other things. Healing Touch: You can actually heal some wounds with the Heal skill; if someone is dying, and you successfully stabilize them, they regain 1d6 hit points. That’s Immunity/the normal limits of the Heal skill, Specialized and Corrupted/only works when stabilizing a dying character, can only be used once per encounter or every few minutes outside of combat (2 CP). Once again, this is basically a generic skill expansion and uses the same mechanics. This is one that I’d keep a closer eye on though; I’d probably substitute “only usable (small number) times per day on any one character” for the once-per-encounter limitation. It seems like repeating this kind of thing on someone would seriously stress their body – and if you need it more than once per encounter, you’re already in enough trouble anyway without being told that your second dying friend can’t get 1d6 of healing if you stabilize him or her.